Modelithics and Mini-Circuits have collaborated to create Microwave Global Models™ for Mini-Circuit’s YAT and RCAT broad-band surface mount attenuator families. These attenuators can be used to reduce signal levels, increase isolation, or improve impedance-match and return-loss performance. Both the plastic QFN package style YAT Series and the hermetic ceramic cavity RCAT Series are available in a tiny 2mm x 2mm footprint. The key to Mini-Circuits’ YAT and RCAT attenuators’ small size, excellent uniformity, and 2W power rating is the GaAs semiconductor fabrication process having through-wafer Cu metallization vias to realize low thermal resistance and wideband operation. Available values range from 0 to 30 dB and these components are well matched to 50 ohms over the entire DC to 18/20 GHz specification range. Although these attenuators are specified to 18/20 GHz for the same configurations, measurement and model data from Modelithics shows excellent broad-band performance to 30 GHz in some cases. The Microwave Global Models demonstrated in this paper using Keysight Advanced Design System (ADS) software, are equivalent circuit based and developed to capture component performance on both grounded coplanar waveguide (GCPW) and microstrip footprints. Not only are the models attenuation value scalable (Figure 1), but microstrip versions of the model are also substrate scalable. This means that using a single Microwave Global Model, the designer can simulate an entire family of components, experiment with substrate and ground configuration effects, and choose the most appropriate attenuation value. Also, thanks to Mini-Circuits’ sponsorship as part of the Modelithics Vendor Partner program, all attenuator models discussed here are available for free download from the Modelithics website. These attenuator models are also included in Modelithics SELECT+ free model library. Layout continues to be a critical aspect of circuit design. Decisions as seemingly simple as board selection and how components are grounded can have a major impact on broad-band performance. In the creation of both attenuator models, three different ground configurations were studied—GCPW, microstrip, and “larger ground” microstrip (Figure 2). The microstrip ground configuration can be advantageous when minimizing the size and complexity of the layout is a priority. However, as seen in the performance comparison of Figure 3, the microstrip layout performance quickly deteriorates past 6 GHz. Note that the usable range of the attenuators can be extended by using the GCPW and the “larger ground” microstrip layouts. Both offer very similar broad-band performance. Similar to the performance differences seen due to different ground layouts, simply changing the substrate on which parts are mounted can have a major impact on the performance observed. 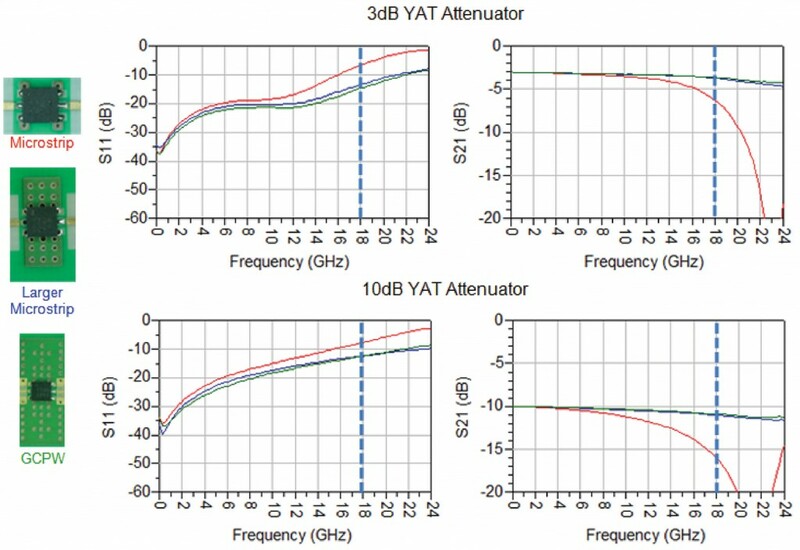 Figure 4 shows the changes in performance of a 10 dB YAT attenuator depending on which Rogers substrate is used for mounting. The best return loss and insertion loss are seen using a 4mil Rogers 4350B substrate, but as substrate height is increased, a reduction in broad-band performance can be seen. This is likely due to the increase in via inductance with increases in board thickness. 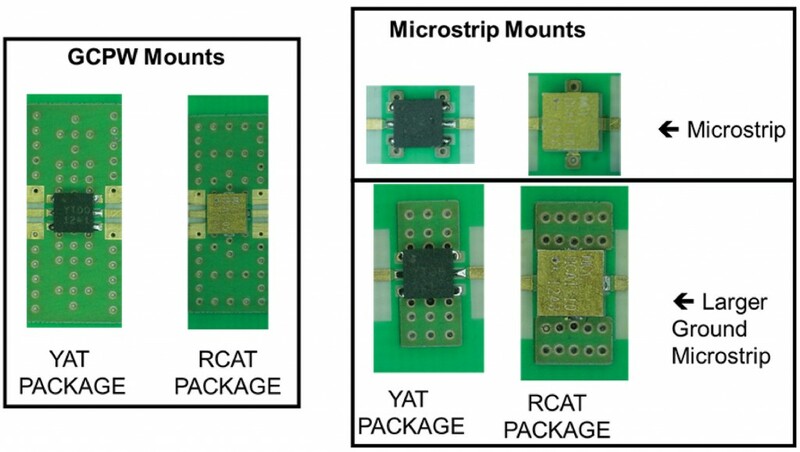 Four separate models were developed as a result of this collaborative effort: RCAT GCPW, YAT GCPW, RCAT Microstrip, and YAT Microstrip. 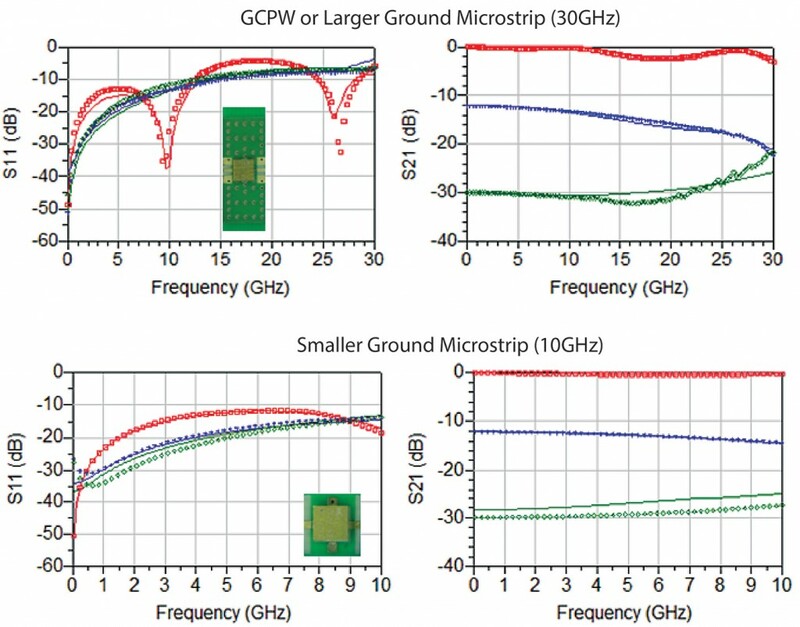 The GCPW models (ATT-MCL-YAT-001-S and ATT-MCL-RCAT-001-S) are validated to 30 GHz and are also valid for the “larger ground” microstrip layout because the measurement results were effectively identical. The microstrip models (ATT-MCL-YAT-002-S and ATT-MCL-RCAT-002-S) are validated to 10 GHz and are for use with space conservative layouts and low frequency applications. These models accurately emulate all attenuator values within the family, capture the effects of layout on performance for the configurations shown, and are valid for a wide range of substrates. An example of the excellent model to measurement agreement achieved by both the GCPW and microstrip models can be seen in Figure 5. Mini-Circuits YAT Series and RCAT Series attenuators cover an attenuation range of 0 to 30 dB and are capable of broad-band performance from DC to 18/20 GHz and beyond. However, layout and board selection can strongly influence this performance. Neglecting to fully account for layout or substrate effects can lead to performance degradation and may even lead to failure meeting design specifications. This is where simulation-based design and the flexibility and accuracy of Microwave Global Models become integral in the designer’s tool kit. Free, accurate simulation models for these attenuators that scale with substrate, part value, and address multiple layout configurations are now available. This application note was developed by Isabella Delgado and Larry Dunleavy of Modelithics, and Harvey Kaylie of Mini-Circuits. The authors would like to thank Ted Heil of Mini-Circuits and Hetvi Patel, Hugo Morales and Laura Levesque of Modelithics for their important contributions to the described work. Figure 2: Three different ground layouts are shown; GCPW (left), microstrip (top right), and “larger ground” microstrip (bottom right). Designed for fixtures on 10-mil Rogers 4350B. Figure 3: Measurement data comparison of microstrip (red), “larger ground” microstrip (blue), and GCPW (green) measurements for a 3 dB (top) and 10 dB (bottom) YAT attenuator. Data on 10mil Rogers 4350B (reference planes are at the pad edge). Dashed line marks the Mini-Circuits specification limit of 18GHz. Figure 4: Substrate effects on attenuator performance. Data using microstrip configuration of 10 dB YAT attenuator: Red: 4mil Rogers 4350B, blue: 10mil Rogers 4350B, green: 60mil Rogers 4003C. Solid lines: model data, Symbols: measured data. Figure 5: Modeled to measurement comparison of RCAT attenuator on GCPW or “larger ground” microstrip layout to 30 GHz (top), versus small ground microstrip performance to 10 GHz (bottom). Data shown on 4mil Rogers 4350B. Red: 0dB, blue: 12dB, green: 30dB attenuator. Solid lines: model data, Symbols: measured data.